Court House Mews at Church House in Torver, Cumbria sleeps 2 people. 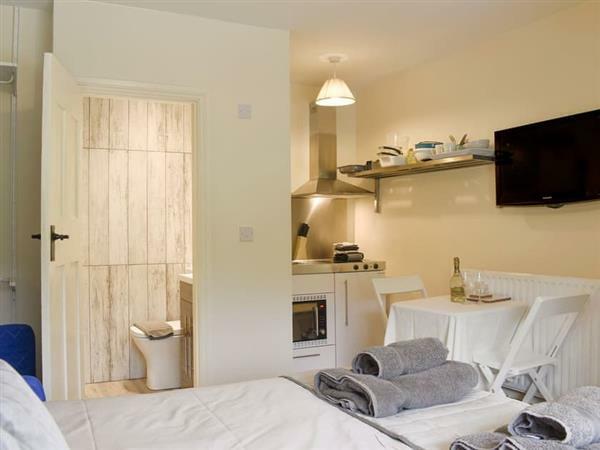 Church House in Torver; this studio apartment is situated in the beautiful village of Torver. Comprising open plan accommodation, it is attached to an historic coaching inn which serves local beers and offers home cooked meals. Torver is located just over one mile from Coniston which is ideal for water sports, and superb walks to enjoy include ‘The Old Man of Coniston’. There is easy access to both Windermere and Ambleside as well. The beach is 14 miles from Church House in Torver. With the shop 200 yards, the pub is 100 yards and the restaurant is 10 yards from Church House. (All accommodation at Church House refs UK11119, UK11120 [Church House Mews]). Court House Mews has 2 steps to the entrance. Bedroom area: With king-size bed. Oil central heating, electricity, bed linen, towels and Wi-Fi included. ½-acre grounds with patio, terrace and garden furniture (shared with pub). Bike store. Private parking for 2 cars. No smoking. Please note: No children. Holidays at Court House Mews, Church House run from Friday to Friday. Pets allowed at Church House - Court House Mews. For a better idea of where Church House - Court House Mews is, you can see Church House - Court House Mews on the map below. Church House - Court House Mews is in Cumbria; should you be on the lookout for a special offer, you can find all the special offers in Cumbria. It's always worth checking to see what is on offer at the moment. Do you want to holiday near Church House - Court House Mews (UK11119), you can see other cottages within 25 miles of Church House - Court House Mews; have a look to find your perfect holiday location.